Admired politician, Sir Robert Chiltern, has a comfortable income and an unblemished reputation. His enviable existence is strengthened by the love of his wife Gertrude and the adoration of his sister Mabel. Complications erupt for Robert when Mrs. Laura Cheveley, a past acquaintance, arrives in London for an extortion attempt using a previous indiscretion of Robert's. Panicked, Robert turns to his ally and friend, Lord Goring, a charming man who is both calculating and dishonorable enough to help Robert. Lord Goring enlists the aid of devoted Gertrude in facing this endeavor, while risking the possibility of capturing the heart of Mabel. 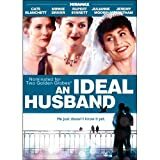 The answer to what constitutes an ideal husband lies somewhere between a man presumed to be upstanding and another presumed to be a scoundrel.